Chiara was raised into the mafia world the hard way. Enduring the assault at the hands of her father until she was kidnapped and forced to marry a mob boss. One she’s sure is even worse than her father. Ricca never backs away from a challenge. When the woman he kidnapped sneers he would never own her, he’s more than happy to prove her wrong. It doesn’t matter he is being forced into this marriage by The Syndicate, to cover-up the kidnapping. An enemy is forging a plan to take Ricca down. Can a marriage, even one forced by the decision of others, turn into a solid band of trust, loyalty, and eventually love? Or will either one—or their enemy—rip out their heart to stop it from beating? Dive into this Mafia Romance where the value of human life is worth less than loyalty. I love a good book that takes you on a roller coaster ride of emotions. I can honestly say Ricca and Chiara's story did just that for me. 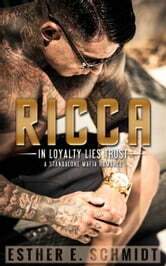 Regardless of how ruthless Ricca is, he has a baseline of rules and morals. You either dedicate yourself or you find yourself truly screwed if you cross him. Chiara was a test of those rules in many ways. In a moment of battle, he makes a decision that changes everything and turns starts an all-out war. Chiara knows what the mafia life is all about. She's a mafia princess who has been brought up to be a certain way, at all costs. She understands the line of loyalty that must be drawn in order to keep yourself and your family safe. When the battle begins she believes she's been traded from one monster to another. When the war finally comes through, it's fight or fall. The two of them together is the perfect play of fierce, strong but also incredibly tender. They must figure out if they can be united in the worst of times. This is a fabulous, binge-worthy, emotional ride of a book that will keep you talking to yourself and your e-reader! Loved every bit of it! I didn't know I needed this story! Having read all of this authors books with Ricca as a secondary character, I was okay with him remaining there; but I am beyond glad that this author decided to give him his own story. Ricca is a strong, dominate character that proves what it means to be Alpha and Mafia. I loved his strong hand with everyone but most importantly with his love. She was bold and strong as well and the perfect match. I loved the plot of this story and could not stop reading. It can be read as a standalone but I encourage you to read all of these books, you will not be disappointed.